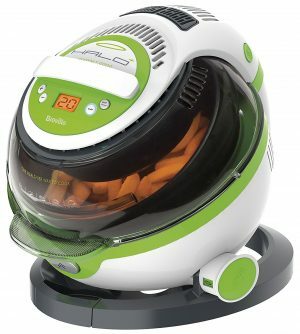 Air fryers attempt to cook food in a cleaner, safer and healthier fashion by circulating hot air around food in order to cook it. By using hot air instead of fully frying the food in oil, not only does the food come out cooked the same as conventional frying, but it is much healthier, with some fryers claiming to cook food with up to 80% less oil than the same food deep fried. Today, we will have a look at some of the best air fryers available on the market and see which one is suitable for your kitchen – whether you are new to the air drying phenomenon or are a seasoned cook. For a quick comparison guide, take a look at the table below which will tell you the capacity and power of each air fryer in this guide. Which air fryer should you go for? 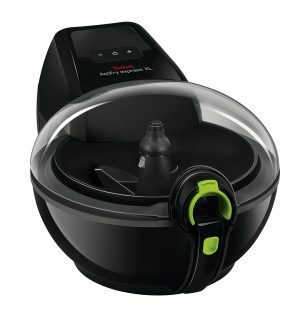 The Tefal Actifry is a low fat fryer that claims to cook up to 1 kg of chips with just one spoonful of oil using Tefal’s patented ‘Dual Motion Technology’, where a paddle continuously turns the food around the fryer when in use, ensuring that an even coating of oil cooks the food inside well. It also has settings for a multitude of other foods such as curries, casseroles, chicken breasts, sausages and even desserts. The fryer has a companion app for iOS and Android which contains over 250 recipes and ideas for utilising the fryer. The Actifry is dishwasher safe due to its plastic build and also looks relatively minimal with its darker tones and lime green accents. Tower Kitchenware is a UK based company popular for its line of kitchen appliances. 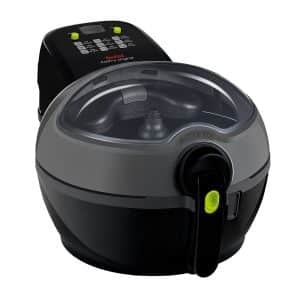 The Tower T17005 air fryer is a great bench top fryer requiring little to no oil to cook a variety of different foods including chips, chicken drumsticks, casseroles and more. The air fryer includes a temperature control which allows you to adjust the temperature from 80 to 200 degrees Celsius, and also allows for different cooking methods such as grilling, roasting, and baking. The T17005 also comes with a very generous 3.2L capacity which is rated to serve a family of 5 comfortably and is equipped with a timer of up to 30 minutes. The fryer comes with easily removable, dishwasher safe parts which are non-stick. Technology wise, the fryer comes with a mobile app which is compatible with Amazon Alexa, allowing you to use voice commands to find quick and easy recipes for you and your family. The Tower T17005 also comes with a 3 year guarantee for peace of mind. The Phillips HD9220/20 Healthier Oil Fryer claims to cook food with up to 23% fewer calories and the same good taste (in the case of fries) as traditional fryers. Using its patented ‘Rapid Air Technology’, the fryer fries as well as bakes, roasts, and grills a variety of foods while creating less smell than conventional oil based fryers. It comes with an integrated 30 minute timer with an ‘auto off’ function and comes with an audio indicator to let you know when your food is ready to eat. There is also included in the fryer a fully adjustable temperature control gauge up to 200 degrees C, and it comes with a powerful 1425W motor which should aid in the quick frying of foods. Capacity wise, it is a little smaller than other fryers on the list at 0.8L, and all the cleanable components are dishwasher safe. The fryer also comes with a recipe book for more suggestions and cooking ideas. The Tefal ActiFry Family Express XL is the larger cousin of the Tefal ActiFry, coming in with a larger capacity of 1.7L. It also promises to cook food up to 30% faster than the original ActiFry. It comes with a fully transparent lid so you can keep an eye on your cooking while it happens, and it is loaded with a hefty 1550W motor for extra power. The Family Express XL certainly isn’t the sleekest fryer of the brunch and will take up a considerable amount of bench space in your kitchen. The Morphy Richards 480001 Health Fryer comes with a large 3L capacity, enough to feed an entire family. It comes with eight pre-programmed functions on board to make cooking certain foods as easy as one click. It also has several different cooking modes such frying, baking, roasting, and grilling. Its ‘Rapid Air Technology’ allows for the even distribution of air throughout the fryer, resulting in an even cook. The main frying pan is also perforated, which allows hot air to circulate from top to bottom. It also comes with a defrost function, so that frozen food can be defrosted and prepared for cooking immediately. The Morphy Richards Health Fryer comes with a multitude of technology based features as well – it comes with an iOS and Android mobile app, and also comes with a digital touchscreen interface which is used to set timers, temperature control and select from the pre-programmed settings. The Power Air Fryer XL is a 5 in 1 digital air fryer which claims to cook foods up to 70% faster than conventional cooking methods like deep oil frying. The 5 in 1 cooking methods are air frying, roasting, grilling, baking, and sautéing. Design wise, the Power Air Fryer appears sleek and modern and comes with removable, dishwasher safe parts. The cooking capacity is relatively large at 3.2L in volume, and the fryer comes with a digital display which is used to select cooking method and temperature control, as well as seven different preprogramed cooking modes – fries, shrimp, pork chops, baked goods, steak, chicken, and fish. After selecting the mode, the idea is that you simply place your food into the fryer and it does the rest. Despite this, you are still able to adjust time and temperature settings for even greater control. The Power Air Fryer also comes with a built in timer and automatic shutoff features, designed for safety in mind. Like other fryers in the list, the Power Air uses cyclonic superheated air to cook the food inside the cooking area. One thing to note is that users have referenced less than satisfactory customer service, and issues with inserting and removing the cooking basket (especially when the fryer is still hot). 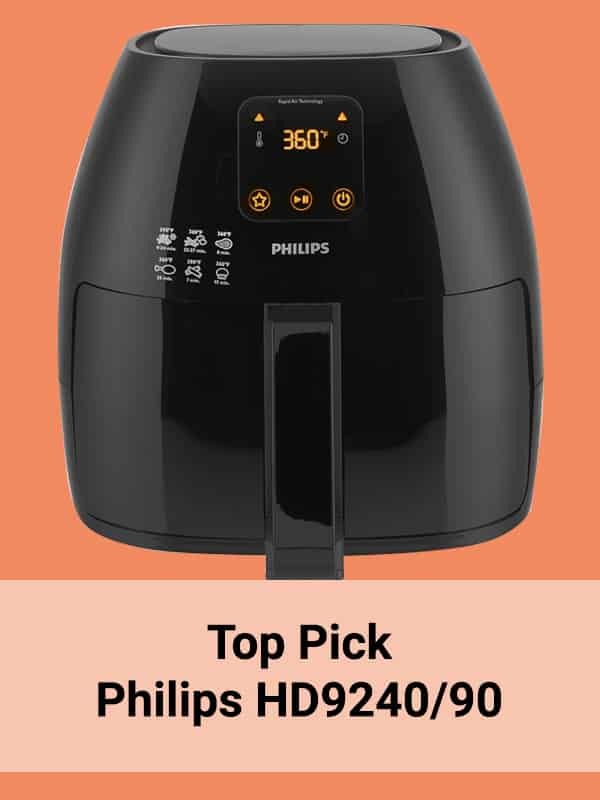 The Philips HD9240/90 Avance Collection air fryer is an extra large, 2100W air fryer that claims to cook food up to 80% faster than conventional cooking methods, and its rapid air technology also reduces the number of calories (in the case of fries versus conventional deep frying methods). It comes with a 1.2L cooking capacity and can feed up to 5 people, coming in at 50% more capacity than its smaller brother, the Phillips HD9220. Design wise, the HD9240 comes in a sleek black exterior that is cool to the touch, even when the fryer is in use. Unlike some of the other fryers in this article, the Phillips HD9220 uses a ‘drawer’ style opening which means that food is loaded in from the side, unlike top loading fryers. It also comes with a digital touchscreen interface where you can control the time, temperature and cooking modes. The Phillips also contains removable dishwasher safe parts. The fryer comes with an international recipe book ‘created by culinary experts’ and contains dozens of recipes for use. 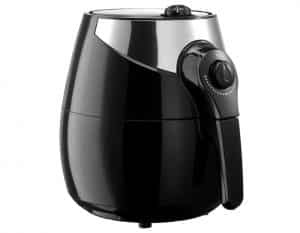 The Breville VDF105 Halo Plus Health Fryer is a 1.2L air fryer by the popular appliance company, Breville. From first looks, it seems like an oddly shaped fryer, with its unique circular design. The fryer uses fan assisted dual heat sources to cook the food inside which means a lower initial heating time. The bowl also rotates during operation, which means that the food inside is effectively ‘tumbled’ ensuring an even frying process. The Breville comes with a 75 minute digital timer and includes a sound alert system and automatic shut off for peace of mind. The lid is removable and dishwasher safe for convenient cleaning. It also comes with four cooking modes – including frying, baking, grilling and sautéing. Users have reported that despite its odd looks, the fryer is quite good in frying chips due to its tumbling action, which results in all of the chips being well fried and evenly fried. The Aobosi Electric Air Fryer is a 3.6L fryer which uses rapid hot air to cook food with up to 80% less fat than conventional cooking methods. It uses a 1300 W motor and comes with an adjustable temperature control from between 80 and 200 degrees C.
The Aobosi comes in a modern all black design and has a side loading drawer for cooking. Included are multiple cooking modes such as frying, grilling, roasting, baking and even steaming and a countdown timer. All of this is accessible through the digital display system. Included in the box is a recipe booklet with helpful suggestions and tips, which can be used with the preset food cooking options or through the manual system which allows you to set the temperature, mode, time of cooking and quantity of food. Cleaning wise, the Aobosi includes a detachable dishwasher safe cooking basket which makes cleaning easy. 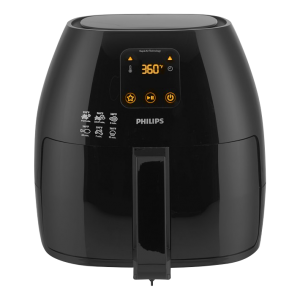 Best quality & features – In terms of the best quality and features overall, we recommend the Philips HD9240/90 Avance Collection air fryer. 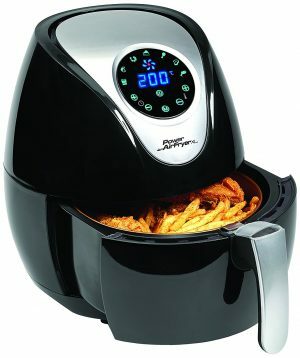 Although this is the priciest air fryer, the amount of features it brings for that price is impressive. Safety features include a cool touch exterior, automatic shut down once the cooking/timer is up, and a proven track record of customer service and warranty honouring. While it does not have the breadth of cooking modes as other fryers on the list, user reviews have reported that the four modes that are included with the fryer (frying, baking, roasting, and grilling) are top notch in both quality and quantity of food it produces. 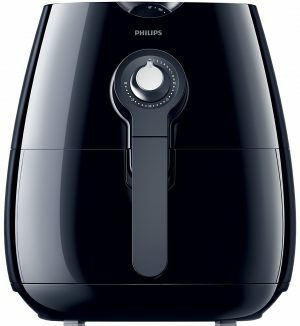 If you are looking at the top of the line air fryer, then the Philips HD9240/90 Avance Collection air fryer is for you. 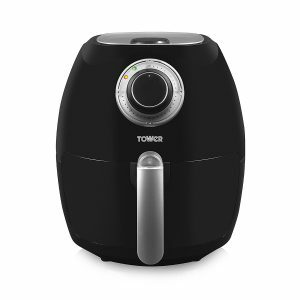 On a budget – If you are on a budget and are looking for an air fryer which can give you the biggest bang for your buck, then we recommend the Tower T17005 Air Fryer. Priced low, this fryer provides plenty of features for the price. In particular, it comes with a large frying capacity of 3.2L and includes features such as temperature control and removable dishwasher safe parts. For the price, be prepared to give up some features – pre-programmed presets, multiple cooking modes, transparent lids etc. However, if you are looking for a no frills fryer which can get the job done, then look no further than the Tower T17005 Air Fryer. Versatility – If you are looking for a fryer with the widest range of cooking options, then look no further than the Power Air Fryer XL 3.2L. With 5 different cooking modes (air frying, roasting, grilling, baking, and sautéing) and 7 pre-programmable settings, this fryer is aimed at those looking for a breadth of cooking options from one appliance. 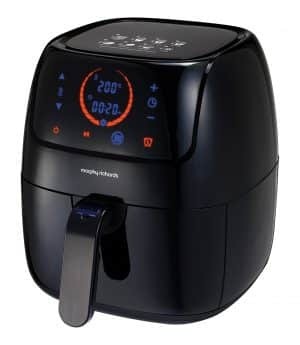 Large scale air frying – If you are looking for an air fryer which can cook large quantities at a time, then the Morphy Richards 480001 Health Fryer may be the one for you. Coming equipped with a large 3.2L cooking capacity, the Morphy Health Fryer has the capacity to cook a lot of meals. In addition, the Morphy comes with a special defrost mode which is perfect for thawing a chicken or other meats ready for roasting. The Morphy comes with access to a mobile app for both iOS and Android which gives the user access to a world of different recipes and ideas for cooking up a family feast. When looking at purchasing an air fryer, there are several factors to consider, which we will go into detail below. Air fryers are primarily designed to be table and bench top appliances, and you should consider what size of air fryer will be suitable for your kitchen. Purchasing an air fryer that is too large for your cooking area will result in a sub-par experience as the fryer will become difficult or inconvenient to use. At the same time, consider the number of people you will be cooking for when using the air fryer. Will you be cooking for one, a couple or a large family? The answer to this will determine what capacity size is best for you. There is little use in purchasing a smaller capacity fryer if you are cooking for large groups of people as this will result in a longer cooking and preparation time. Air fryers come with a variety of safety features. One big downside of conventional deep frying is that the cook’s hands, wrists, and arms are exposed to a tub of hot oil which can splash and splutter if the food contains water or is low quality. Because air fryers come with a lid or a drawer that covers the food while being cooked, this risk is eliminated. When looking for an air fryer, pay attention to what safety features it includes. Some of the higher end fryers come with additional features such as automatic shut off after cooking (to prevent overcooking the food and also reduce the risk of fire). Air fryers also offer a form of convenience that is not present in conventional deep frying. Not only can they fry, but several air fryers also come with a variety of different cooking modes, such as baking, grilling, steaming, and roasting. This means that the possibilities become endless as to what you can cook and eat out of such a small appliance. Depending on the price, an air fryer can be a substantial investment in your kitchen. That being the case, keep an eye out on what additional support you are getting from the company when you purchase your fryer. For example, many fryers come with recipe books or links to mobile applications with more recipes and ideas on how to fully utilise your fryer. Bear in mind what is also included in the box before you purchase your fryer. Some fryers come with a barebones package consisting of just the fryer and a user manual, whereas others can come with accessories such as baking trays, different cooking and grilling surfaces and more. The length and coverage of the warranty is also an important consideration – if your fryer breaks down or develops a malfunction, the warranty will be crucial in getting technical and customer service support to get you back on track and cooking again. As you can see, the world of air fryers is truly vast. There is a fryer to suit anybody’s needs, whether that be big or small. If you are new to air frying, hopefully, our recommendations help you take that first step into a cooking lifestyle that is both convenient and easy to use, as well as healthier on your diet and your body. Have fun, experiment and find out which recipes work for you – as they say, the world is your (air fried) oyster!